In this age when children can be bullied at school or snatched by strangers, parents are using high-tech tracking devices and emergency alerts to help protect their loved ones. 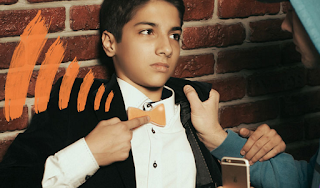 Now there’s a new wearable invention called Bow2tie that disguises an audible alert inside a fashion accessory shaped like a bowtie. The can be worn as a bow tie for boys or a hair clip for girls. When pressed, it emits a high-volume sound that works as a distress signal and call for help. According to Bow2Tie’s developers, the alert is loud enough to attract attention but not too loud to cause hearing damage. The developers plan to launch a crowdfunding campaign to raise money to produce the device in different styles and colors. The alarm will be housed in a durable casing with a rotational clip and powered by a small but long-lasting battery. In addition to wearing the device as a neck tie, Bow2Tie models can also be worn as a pendant or bracelet. For more details and to sign up for email updates, visit the Bow2Tie website and Facebook page or follow @Bow2Tie_USA on Twitter. And check out the video below to see the device in action.